Marketing veteran Jacqueline Taylor-Adams shares advice, insights, and strategies to help you build your brand and business. 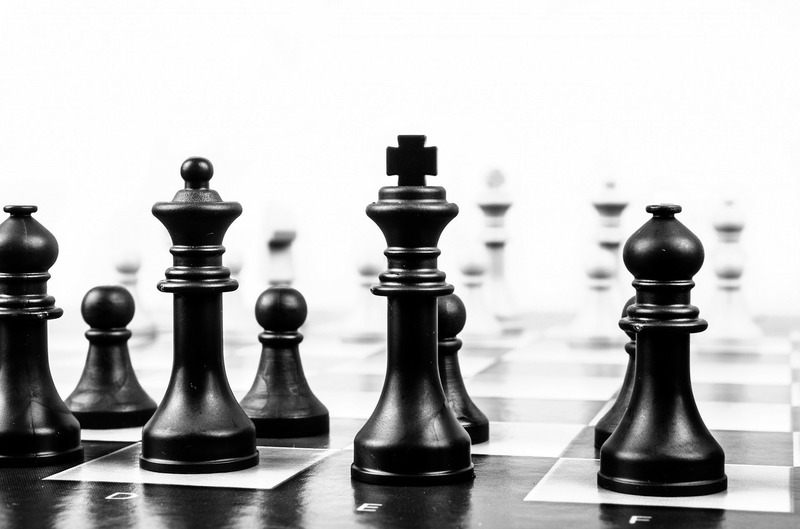 NEWS FLASH: Marketing is not a singular tactic. Marketing is a strategy. The strategy is built on consumer behavior and processes are used to move you from a product/service to a sale. Now, you may kick and scream all you want (aka waste time employing single tactics outside of a plan), but until you take the time to create and employ your marketing via a strategic plan, you will not get the results you want and that are possible. Beyond employing various marketing and promotional tactics, your marketing must be administered through a strategic framework, a system. I've developed a system, a flow. Though top heavy, once mastered this system / flow / swag it will help you get the results you desire. Help you get sales! The system is your AGASW. Think of it as your marketing swag. The way you flow through this thing called marketing. Your AGASW creates a flow for your marketing and makes it easier to measure what works and what doesn't as well as keep you focused on your audience and goals. This section is self-explanatory. You have to be or become consistent with your marketing efforts. You need a plan that addressed the full circumfrance (360and I do not mean a scheduled post. Read on as marketing and business strategist, Jacqueline Taylor-Adams breaks down the AGASW system, the five cornerstones she developed to build an effective marketing campaign. Know Thy Audience. All roads begin and end with your target audience and existing customers. First who needs and/or wants what you provide? Who believes that the problem you are solving is a problem and who is not aware that they even have a problem? Or whose aspirations, hopes, and dreams are you fulfilling? 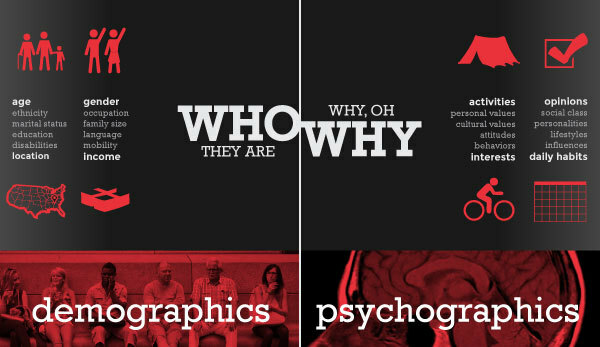 On average is your audience men or women or both? Are they predominately African American or any combination of ethnicity or nationalities? What is the average education level achieved? Are they homeowners or renters, married or single, employed, self-employed, retired, or unemployed? What's their average age range, median household or individual income, and do they usually use cash, debit, or credit? How do they normally engage online, desktop, tablet, or mobile? Are they single mothers, head of household, or parents with school aged children? What do they like to do? Where do they hang out? What's important to them? The better you are able to answer these questions, the more aligned you are with who is your ideal customer. Your existing customers and those who engage you online are your first sources for data. Research your ideal user’s interests, their social media conversations, Google searches, Facebook likes, and you will know how to appeal to their desires. Get to know your existing customers intimately. 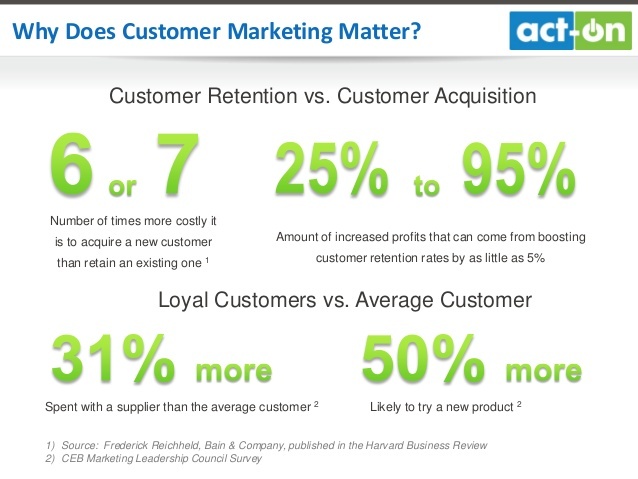 It costs six to seven times more to acquire a new customer than to retain an existing customer. Your current customers have purchased from you, learn more about who they are and discover what compelled them to buy. Khalid Saleh of Invesp states, "The first rule of any business is to retain customers and build a loyal relationship with them, and thereby avoid customer acquisition costs." Review data from your online advertising, event sign-up lists, and any feedback you receive. The analytics derived from advertising with Facebook, Twitter, Youtube, and Pinterest is rich and will give you great insight into who your visitors and customers are. Look at your customer's purchasing habits with you, your competitors, and complimentary niches, too. You must have specific measurable attainable business goals. Your dream goals are doable, just break them down into smaller attainable goals. Knowing your ultimate goal and the goals you need to achieve to produce the ultimate goals gives you the framework to measure and structure your activities. For instance, say you decide you want to produce $10K profit this holiday season. Since, this is profit, you need to determine how much revenue you need to produce and what are the expenses incurred to produce the revenue. Are you including all costs, like administrative, physical space, employee, travel, gas, shipping costs, website management costs, marketing, etc. This goal should also impact what you choose to sell for the holiday season. What items or services have higher profit margins that are also a desired commodity during the holiday season? Once you decide what you are going to sell, then how many do you need to sell to make your desired profit? Will buying in bulk save you money per cost? Are there deadlines you need to be mindful from the distributor and/or manufacturer? These are just a few ways how having specific quantifiable goals help streamline your overall business process. Wikipedia defines analytics as the discovery, interpretation, and communication of meaningful patterns in data...to quantify performance. Organizations may apply analytics to business data to describe, predict, and improve business performance. How do you amass data? Everything is data. Your survey of your customers and target audience. The analytical data you receive from your website analytics (like Google Analytics, SUMO, etc), from your social media accounts, from your sharing and plugins tools, from advertising on and offline, etc. The quality of data you get from engaging and advertising is superior and extremely extremely affordable. Review your data from the previous year's holiday marketing campaigns. Look at what you did, what did you sell, how did you promote it, when did you begin promotions, when did you place your orders for inventory and promotions, who did you hire, what was your strategies, how much revenue and how much profit did you produce? 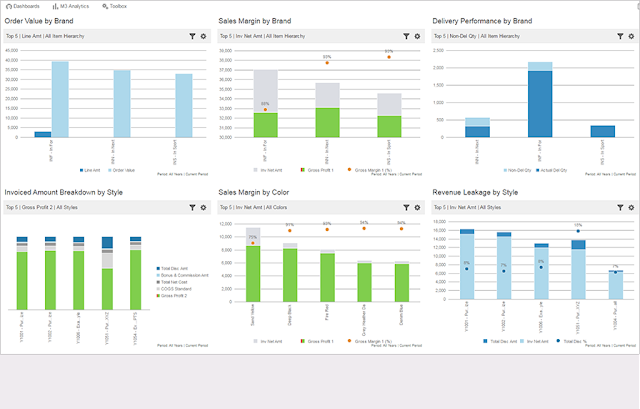 The analytics will help you realize what worked, why it worked, what did so-so, and what bombed. To develop your strategy you use your Audience data and behavior, your Goals, and your Analytics. All your amassed data will help you decide everything from what products and/or services to focus on to which colors to use, what style of design, where and how to advertise, which collaborations to engage, what activities and experiences to engage and create, and what conversations to have. Events, video, live streams, contests, sales, specials, pop-ups, appearances, blogging new and hot product reviews, linking to reviews, how to save data, and whatever your mind can imagine that is compelling to the audience you defined, leverages the data derived from the analytics, and places you on the road to attain your goals. Analytics often involves studying past historical data to research potential trends, to analyze the effects of certain decisions or events, or to evaluate the performance of a given tool or scenario. The goal of analytics is to improve the business by gaining knowledge which can be used to make improvements or changes. Want to be more focused and productive with your marketing? Get your AGASW, your marketing swag, on. Build consistency and flow (a guided system) in your marketing. We come to work, be better, and form a powernetwork. 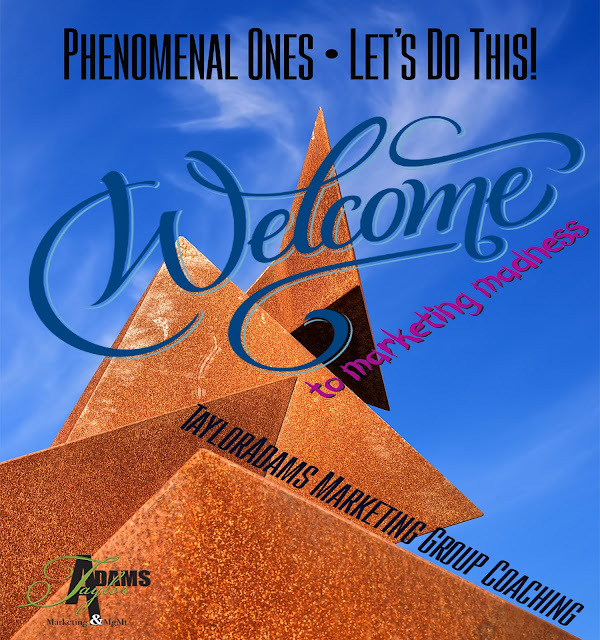 When you decide you want to be better with marketing and are willing to do the work, the first step is to get on the list http://bit.ly/TAMMGroupCoachingSignUp and everything else you'll need will follow. Welcome, Phenomenal One! Thank you for allowing me to be your marketing guide for this moment in time. Be prepared to work. The work isn't hard, but we are working at being consistent. So, sacrifice the time now and you will reap the benefits down the line. 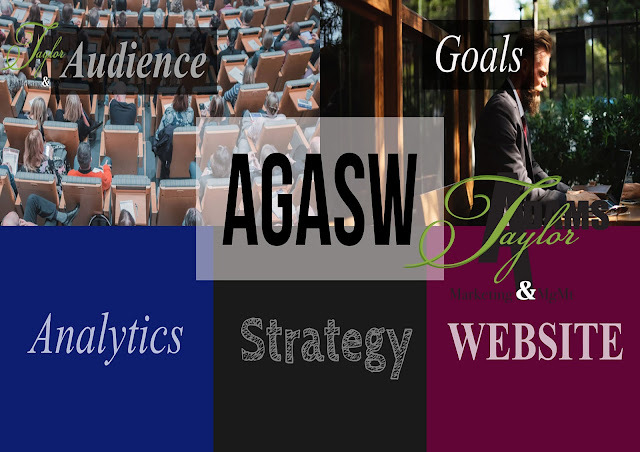 We use the AGASW framework to establish our marketing flow. Click the player below to learn more detail about TAMM's Group Coaching and Starting Sunday Marketing Exercise Series.